﻿ Real Madrid 2-1 Malaga. Ramos shows how it's done! 21.01.2017 » Real Madrid 2-1 Malaga. Ramos shows how it's done! Real Madrid bounced back after two consecutive losses and beat Malaga 2-1 at the Bernabéu for La Liga. Sergio Ramos wore his superman suit once again and secured the 3 points in a difficult game for the Merengues. After back to back losses against Sevilla and Celta de Vigo, Real Madrid finally found the path to victory again in a 2-1 win over Malaga at the Santiago Bernabéu. 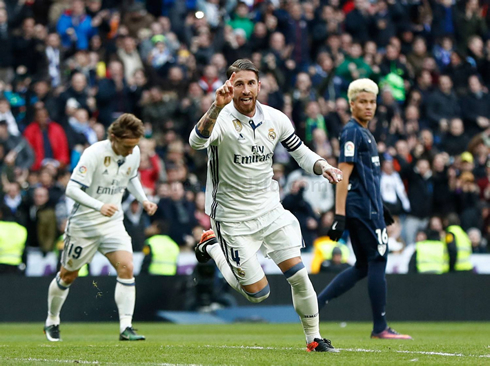 It was far from an easy game though and it had to be the captain Sergio Ramos stepping up and scoring the 2 goals for the hosts. With today's win, the Merengues relieved some of the pressure that has been building up over the past days and can now focus in their Copa del Rey second leg game against Celta de Vigo, where they'll need to come back from a 2-1 disadvantage. On the plus side, Real Madrid were able to return to winning ways after their two game skid defeating Malaga 2-1 at home. 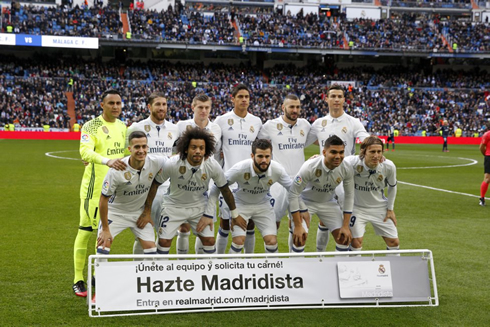 However, Madrid struggled to be decisive in the final third and allowed the Andalusian side to stay around for far too long. Sergio Ramos was again the hero, making up for his mistakes in the last league match against Sevilla, scoring twice today (both times from Toni Kroos deliveries) in the first half. Both Kroos and Ramos were excellent today, as evidenced by the scoresheet and with Kroos setting up both goals. The German dominated the midfield and was class throughout. On the attack, Isco was fantastic today as well. He added such an important element with his ability to hold on to the ball and being patient, that he makes us think he deserves a bit more opportunities in the games ahead. For some reason, Madrid's finishing in front of goal has become more and more sporadic. As we head into the business end of the season, the attack has to put away their chances. With Bale set to return next month and James also closer and closer to a return, it's a good time to be hopeful about the future. There are hard games to come in the coming months and the injuries are a bit worrying right now, but at least Real Madrid were able to put their winless streak behind them! Cristiano Ronaldo next game is a Copa del Rey fixture, on January 25 of 2017 against Celta de Vigo. You can watch Juventus live stream, Celta de Vigo vs Real Madrid, Eibar vs Barcelona, Chelsea vs Hull City, Arsenal vs Burnley, and Southampton vs Leicester City, all matches provided from our soccer live game pages.